These are excellent! Siced chicken or turkey breast or any choice of cold meats may be used instead. These are not really recipes as such...they are just too easy and you can certainly play with these and use spicy, canned jalapenos, if you like. In food processor with sharp blade or blender, process cream cheese, chives or green onion and garlic powder until smooth. 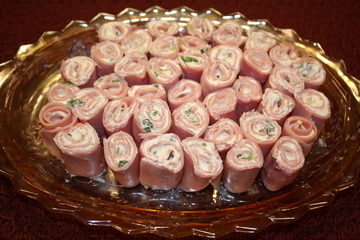 On large plate, assemble ham roll-ups. Place ham slice down and pat dry with paper towel. Place slice of Swiss cheese on top and spread 2 tsp (10 mL) cream cheese mixture over surface. From long side, roll up, using extra cream cheese mixture, if necessary, as “glue.” Slice into 6 pinwheels. Repeat. Make a mayo, sour cream and Dijon mustard mixture for spreading on the ham and roast beef after placing a slice of Swiss cheese on the meat. Add an asparagus (from cans) and roll up!